I think everyone knows constellation Orion, but only few people know that there is Great nebula in Orion, visible even by naked eye. It’s located between his belt and legs. The nebula is approximately 1300 light years from earth and it has 24 light years in diameter. Red color shows a lot of hydrogen gas, which is essence for star formation. 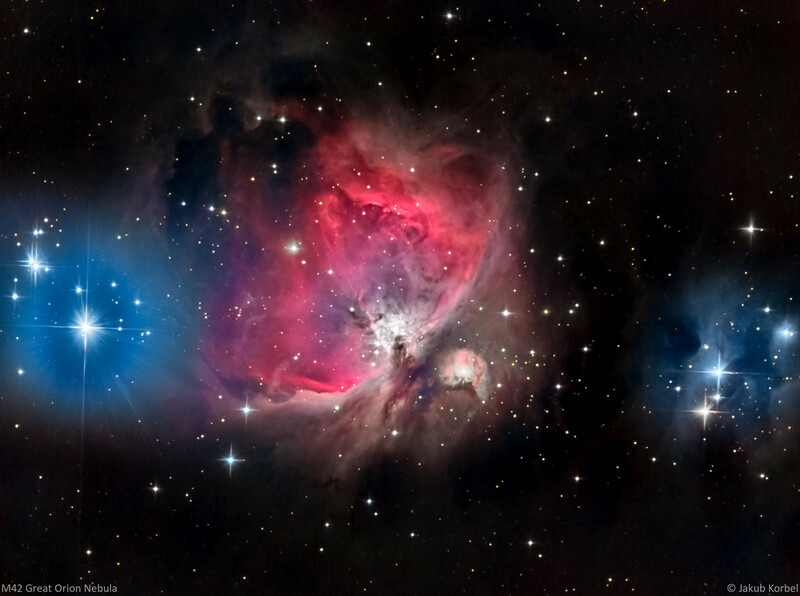 In fact, the Orion nebula is the closes location from Earth, where the stars are born. Since this nebula is visible by naked eye, with help of telescope even with sub-urban area, it’s not necessary to use long exposure times. I used just 3 minutes exposures and the picture yielded in nearly overexposed photo. Small nebula on the right side is NGC1973 Running man nebula.